Build two hygienic latrine facilities at local schools, and educate all members of the community to reduce stigma. Increase awareness and knowledge of adolescent girls regarding HIV/AIDS and proper menstrual hygiene management (MHM). Empower young girls through leadership training and health clubs with access to reproductive and sexual health information. Train 200 rural women in making reusable sanitary pads and sell them to local businesses to increase the use of reusable sanitary pads within the community. Construct safe latrines which will improve school attendance as these WASH facilities provide necessary safety. The Minga Foundation has partnered with LUWODEA (Lubengoa Women’s Development Association) based in the rural town of Kamuli, Uganda since 2016 through two main projects. 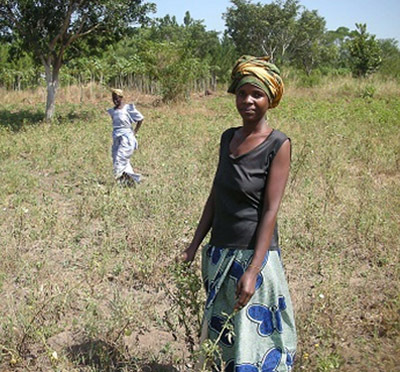 The first project that Minga supported was the Food Security and Empowerment program, a train-the-trainer program that helped >300 women in 25 villages with equipment, seeds, and training on organic vegetable farming techniques as well as business and leadership skills. Building on the success of this project, LUWODEA then identified another need in their community: female youth missing school due to their menses. Currently, Minga and LUWODEA are partnering on a Menstrual Hygiene Project, aimed at reducing school absenteeism for school aged girls who are menstruating and providing a sustainable source of income for adult women in the Kamuli area who will be making and selling reusable sanitary pads. Each month, one out of every ten adolescent school aged girls in Sub-Saharan Africa misses two to three days of school due to shame and cost associated with menstruation. In many communities, menstruation is stigmatized and disposable pads are prohibitively expensive. In one school year, these same girls may miss up to twenty percent of their education. Disposable menstrual pads can cost the equivalent of 15 USD annually, more than three times the cost of sustainable pads. Disposable pads also create a large amount of environmental waste. Thirteen year old Kisayke Angella, who lives in the Kamuli district, hopes to become “a qualified nurse in [the] future so that I [can] help other women in my area.” To achieve her dream, she must be able to continue her education even during her menses. The Minga Foundation and LUWODEA are seeking funding to support the Menstrual Hygiene Project, which aims to provide 200 jobs for women creating sustainable menstrual pads, allow 5,000 girls to continue going to school while on their menses, build two hygienic latrine facilities at local schools, and to educate all members of the community to reduce misinformation and stigma. The estimated cost of this project is roughly $25,000 US dollars.